Many advertising networks that serve ads on popular websites engage in a practice called “interest-based advertising” or “online behavioral advertising”, whereby information about your visits to various sites in partnership with the ad networks is collected in order to send you advertisements based on your interests. In addition to collecting information based on your interests, many of these online ad networks also collect location information such as city or zip code, as well as demographic factors like age, gender, marital status, family size etc. While ad networks say that targeted advertising allows them to send you advertisements that are more relevant to your interests, and that these ads help to keep the content of several informational websites free, many people feel uncomfortable about the idea of their browsing history and identity information being collected in a form of profiling. These concerns have helped motivate the creation of The Digital Advertising Alliance (DAA), a consortium of leading national advertising and marketing trade groups that establish self-regulatory principles and guidelines to promote consumer transparency, consumer education and consumer control over what data can be collected about them. 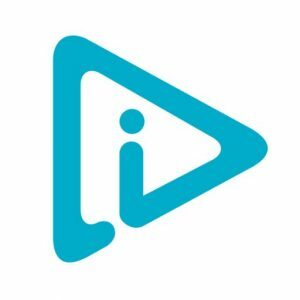 A product by the DAA called YourAdChoices, places an icon that looks like this on webpage ads served by over 100 participating companies. When clicked on it will tell you what information the ad is based on and provide options on how to opt out of ads personalization. 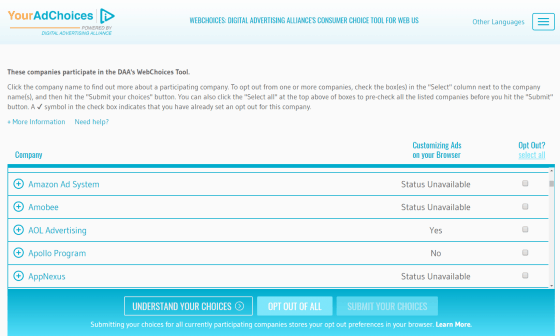 They also offer a neat tool to the consumer to go with this product called WebChoices, found at http://optout.aboutads.info, which will generate a list of participating companies and scan through your web browser to determine which of these companies have currently enabled customized ads for your browser. You can click on a company to find out more information about their practices and decide if you want to opt out of customized ads with them. If you’d like to opt out of all personalized ads, simply click on the button labeled “OPT OUT OF ALL” at the bottom of the page. All participating companies will remember this setting going forward via the placement of an opt-out cookie in your browser. You will still continue to receive ads, however they will no longer be based on your interests and demographic factors. Keep in mind that the opt-out settings only applies to the specific web browser (i.e. Firefox, Chrome, Edge, Internet Explorer etc.) on the device you are using, so if you are using multiple web browsers and/or multiple devices/computers, you will need to visit the WebChoices page on each browser and device in order to apply the settings across the board. Also, because the opt-out preferences are stored in your browser via cookies, clearing your cookies within the browser or through a cleaning tool such as CCleaner may delete the opt-out cookies. To remedy this, you can periodically visit the WebChoices tool to refresh your settings, or alternatively, install the Protect My Choices extension for Chrome, Firefox or Internet Explorer, which will help prevent the accidental deletion of these cookies. Please visit http://www.aboutads.info/PMC for more details and the links to install the extensions. There is also a YourAdChoices app available for the iPhone, iPad and Android phones and tablets called AppChoices , which will allow you to make choices for interest-based ads in apps on your portable devices. Please visit https://youradchoices.com/appchoices for more information and links to install the AppChoices app for your particular device.